Justin really enjoyed the Bacon-Wrapped Scallops last month, so for his birthday (another post with more about his birthday dinner coming up), we had to improve upon those! We picked up some plump tiger prawns and got to work. 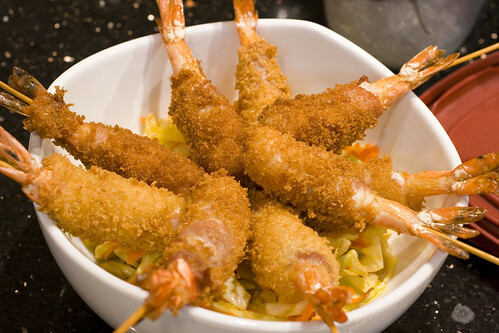 Our plan was to wrap them in thin bacon, and deep fry them with a panko crust. Instead of a sauce, we came up with a flavorful slaw to accompany the dish.